Most days I find myself really hungry between meals...I'm always searching for a snack. Especially days I go to the gym. By the time I get home I'm so hungry but first I always have to look after what Bilal needs so I keep delaying eating something. Last week was The Secret Recipe Club's reveal day. Dorothy at Shockingly Delicious made some Peanut Butter Chocolate Chip Power Bites which she had found over at Cooking Whims. These looked like the perfect quick snack to help me get over those hunger pains. 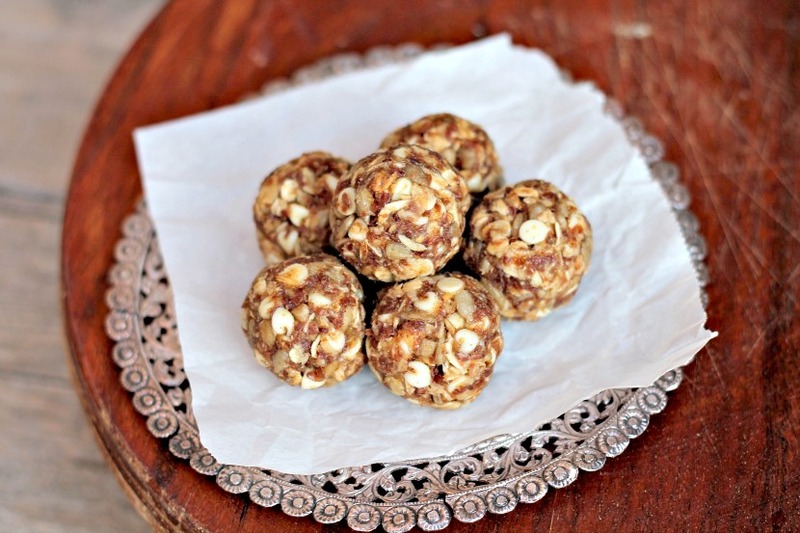 These energy bites are extremely easy to make and are very yummy....just make sure that you have just one since they are calorie dense! I also shared them with some friends for our weekly morning walk and got great reviews! Mix all the ingredients in a bowl until well combined. Refrigerate for at least 1 hour. Break off small pieces and roll into a small ball. Store in an air-tight container in the fridge. I got about 12 bites out of this recipe. Happy to follow you Asiya. This is such a healthy treat! I love the combination of oatmeal plus nuts. Yum these looks good! I make something like this for post-workout snack :) love everything with pb, oats, and chocolate!!! I love this idea! I like making homemade granola bars, but sometimes I don't want a whole bar. These are perfect bite sized treats! Wow, these do look great for before and after workouts. My goal is to gain weight with my weight training and I think this recipe will be a great addition to my diet. Thank you!